Saints come in many sizes and varieties, ranging from kings to beggars, surgeons to street sweepers, scholars to the illiterate, the extraordinary to the unnoticed. Some never marry, some are the parents of large families. Some die in bed in their old age, others die early in life at the hands of executioners. There are millions of saints -- heaven is crowded -- but relatively few of heaven’s population have been formally canonized. The vast majority are rank-and-file saints, an inspiration to those who knew them, but never placed by name on the church calendar. The majority of those canonized are martyrs. One of these -- Alexander Schmorell -- was added to the church calendar this past weekend. His canonization took place at the Cathedral of the New Martyrs and Confessors of Russia, a church in Munich not far from Schmorell’s grave. On the far side of the cemetery, at Stadelheim Prison, Schmorell was beheaded on 13 July 1943. He was only 25 at the time. He was an Orthodox Christian who had put his life at risk by being part of a anti-Nazi resistance group. The frigid air was challenging -- it was about 15 degrees below zero Centigrade (5 degrees Fahrenheit), with snow and ice on the ground. Though the cemetery, Perlacher Forst, was just across the street, its entrance was several hundred meters away. Once inside the gate, we wound our way through tombstone-lined paths, first stopping to pray at the graves of Hans and Sophie School, the brother and sister who were the first to be executed from the White Rose group, and Christoph Probst, beheaded the same day -- 22 February 1943. Here three tall black crosses stand side by side, a single cross piece linking the crosses over the Scholl graves. Sophie, the one woman in the White Rose inner circle, and the youngest, was 21 when she was killed. Today many German streets and squares are named in honor of Sophie and Hans Scholl, Alexander Schmorell, Christoph Probst and others executed for their part in the White Rose. Hans and Sophie came from a closely-knit Lutheran family. Christoph Probst was baptized in the Catholic Church a day before his execution. The procession than continued to Alexander Schmorell’s resting place, not far away. A bouquet of white roses was resting against the rough surface of the tombstone and more flowers heaped over the grave. Embedded in the stone was a bronze Russian Orthodox crucifix. 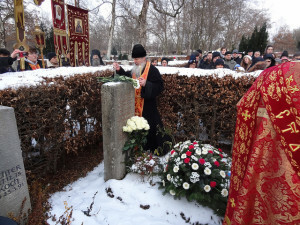 Memorial prayers -- a panikhida -- was sung, concluding with the melodic two-word chant, Vyechnaya Pamyat (eternal memory), sung repeatedly by all present. Every year there has been a panikhida sung at this grave on the 13th of July, the anniversary of Schmorell’s death, but this was the final panikhida. Now that he has been officially glorified, future services at his grave no longer have a penitential character. In the Orthodox Church every Sunday is regarded as a little Easter, but rarely have I experienced so intense a paschal radiance. Resurrection was at the heart of Father Nikolai’s sermon, delivered just before communion. He reminded us that the name the White Rose group adopted for itself had been proposed by Alexander Schmorell. His suggestion came from a story in the novel The Brothers Karamazov, written by Schmorell’s most beloved author, Dostoevsky. In one chapter Christ comes back to earth, “softly, unobserved, and yet, strange to say, every one recognized Him.” He is suddenly present among the many people in Seville’s cathedral square, a place were the pavement is still warm from the burning of a hundred heretics. Responding to a mother’s desperate appeal, Christ raises from the dead a young girl whose open coffin was being carried across the square on its way to the cemetery. Flowers have been laid on her body. “The procession halts, the coffin is laid on the steps at [Christ’s] feet. He looks with compassion, and His lips softly pronounce the words, ‘Maiden, arise!' and she arises. The little girl sits up in the coffin and looks round, smiling with wide-open wondering eyes, holding a bunch of white roses they had put in her hand.” This merciful action completed, he is recognized by the Grand Inquisitor, who orders Christ’s arrest. In a time when fear is being sold every minute of the day, every day of the year -- where would the “war on terror” be were we not prisoners of fear? -- the pilgrimage to Munich to honor a saint who had freed himself from the tyranny of fear gave me an injection of pure courage. Holy New Martyrs are glorified by the Church because, in the particular circumstances of their own times, they bore a clear witness to Christ and in so doing sacrificed their own lives. On July 13, 1943 Alexander Schmorell was executed by means of the guillotine in Munich's Stadelheim Prison. On Sunday (in Russian, the "day of resurrection") the 5th of February 2012, he shall take his place among the band of New Martyrs of Russia, to whom this cathedral church is dedicated. The death of a martyr is always comprised of both the love for Christ as well as, through this love, the exposure of wickedness of evildoers in this world, and therefore also those who pave the way for Satan and his complict servant, the antichrist. Alexander Schmorell's favorite book was The Brothers Karamazov, from which the name "White Rose" hails, as a symbol of purity and resurrection (as evidenced in the resurrection of the girl at the appearance of Christ in Seville at the beginning of the "Legend of the Grand Inquisitor"). The path of Alexander Schmorell led from religious instruction which he received from priests in Munich, to the contribution of an Orthodox worldview via F.M. Dostoevsky in the catagorical repudiation of both regimes, enemies of man and idols that they have become of the "Fueher", Hitler, as well as of Stalin, both nationalist and socialist. The "White Rose" considered Nazi rule as anti-Christian, but for Alexander Schmorell, no less anti-Christian was the regime in which his beloved was enslaved -- Bolshevism. "I admit to my love of Russia without reservation. Therefore I also stand in opposition to Bolshevism." "When he [that is, Hitler] blasphemously uses the name of the Almighty, he means the power of evil, the fallen angel, Satan. His mouth is the foul-smelling maw of Hell, and his might is at bottom accursed. True, we must conduct a struggle against the National Socialist terrorist state with rational means; but whoever today still doubts the reality, the existence of demonic powers, has failed by a wide margin to understand the metaphysical background of this war. Behind the concrete, the visible events, behind all objective, logical considerations, we find the irrational element: The struggle against the demon, against the servants of the Antichrist. Everywhere and at all times demons have been lurking in the dark, waiting for the moment when man is weak; when of his own volition he leaves his place in the order of Creation as founded for him by God in freedom; when he yields to the force of evil, separates himself from the powers of a higher order; and after voluntarily taking the first step, he is driven on to the next and the next at a furiously accelerating rate. Everywhere and at all times of greatest trial men have appeared, prophets and saints who cherished their freedom, who preached the One God and who with His help brought the people to a reversal of their downward course. Man is free, to be sure, but without the true God he is defenseless against the principle of evil. He is a like rudderless ship, at the mercy of the storm, an infant without his mother, a cloud dissolving into thin air. "I ask you, you as a Christian wrestling for the preservation of your greatest treasure, whether you hesitate, whether you incline toward intrigue, calculation, or procrastination in the hope that someone else will raise his arm in your defense? Has God not given you the strength, the will to fight? [...] Though we know that National Socialist power must be broken by military means, we are trying to achieve a renewal from within of the severely wounded German spirit." Jim Forest is international secretary of the Orthodox Peace Fellowship -- www.incommunion.org -- and is the author of many books -- see: http://www.jimandnancyforest.com/books/ . He belongs to St. Nicholas of Myra Russian Orthodox Church in Amsterdam and lives in Alkmaar, the Netherlands.